MXGP Első futam: 1. Jeffrey Herlings (NED, KTM), 34:28.981; 2. Antonio Cairoli (ITA, KTM), +0:31.992; 3. Tim Gajser (SLO, Honda), +0:35.048; 4. Clement Desalle (BEL, Kawasaki), +0:42.339; 5. Jeremy Van Horebeek (BEL, Yamaha), +0:47.791; 6. Gautier Paulin (FRA, Husqvarna), +0:51.183; 7. Romain Febvre (FRA, Yamaha), +0:53.685; 8. Alessandro Lupino (ITA, Kawasaki), +0:57.076; 9. Glenn Coldenhoff (NED, KTM), +1:00.975; 10. Jeremy Seewer (SUI, Yamaha), +1:01.390. MXGP Második futam: 1. Jeffrey Herlings (NED, KTM), 34:33.827; 2. Antonio Cairoli (ITA, KTM), +0:31.568; 3. Tim Gajser (SLO, Honda), +0:37.056; 4. Romain Febvre (FRA, Yamaha), +0:51.917; 5. Jeremy Van Horebeek (BEL, Yamaha), +0:57.637; 6. Gautier Paulin (FRA, Husqvarna), +1:00.420; 7. Clement Desalle (BEL, Kawasaki), +1:02.022; 8. Jeremy Seewer (SUI, Yamaha), +1:02.791; 9. Glenn Coldenhoff (NED, KTM), +1:03.549; 10. Kevin Strijbos (BEL, KTM), +1:30.621. MXGP Verseny eredménye: 1. Jeffrey Herlings (NED, KTM), 50 points; 2. Antonio Cairoli (ITA, KTM), 44 p.; 3. Tim Gajser (SLO, HON), 40 p.; 4. Romain Febvre (FRA, YAM), 32 p.; 5. Jeremy Van Horebeek (BEL, YAM), 32 p.; 6. Clement Desalle (BEL, KAW), 32 p.; 7. Gautier Paulin (FRA, HUS), 30 p.; 8. Jeremy Seewer (SUI, YAM), 24 p.; 9. Glenn Coldenhoff (NED, KTM), 24 p.; 10. Max Anstie (GBR, HUS), 19 p.
MXGP Bajnokság állása: 1. Jeffrey Herlings (NED, KTM), 633 points; 2. Antonio Cairoli (ITA, KTM), 603 p.; 3. Clement Desalle (BEL, KAW), 479 p.; 4. Tim Gajser (SLO, HON), 450 p.; 5. Romain Febvre (FRA, YAM), 432 p.; 6. Gautier Paulin (FRA, HUS), 419 p.; 7. Glenn Coldenhoff (NED, KTM), 353 p.; 8. Jeremy Seewer (SUI, YAM), 319 p.; 9. Jeremy Van Horebeek (BEL, YAM), 312 p.; 10. Max Anstie (GBR, HUS), 231 p.
MXGP gyártók versenye: 1. KTM, 697 points; 2. Kawasaki, 498 p.; 3. Yamaha, 480 p.; 4. Honda, 465 p.; 5. Husqvarna, 443 p.; 6. TM, 227 p.; 7. Suzuki, 226 p.
MX2 Első futam: 1. Calvin Vlaanderen (NED, Honda), 33:49.461; 2. Thomas Covington (USA, Husqvarna), +0:02.429; 3. Jorge Prado (ESP, KTM), +0:03.000; 4. Pauls Jonass (LAT, KTM), +0:04.957; 5. Hunter Lawrence (AUS, Honda), +0:06.680; 6. Ben Watson (GBR, Yamaha), +0:16.661; 7. Thomas Kjer Olsen (DEN, Husqvarna), +0:31.581; 8. Henry Jacobi (GER, Husqvarna), +0:37.706; 9. Jago Geerts (BEL, Yamaha), +0:43.039; 10. Maxime Renaux (FRA, Yamaha), +0:47.676. MX2 Második futam: 1. Jorge Prado (ESP, KTM), 33:59.877; 2. Thomas Covington (USA, Husqvarna), +0:01.736; 3. Calvin Vlaanderen (NED, Honda), +0:10.271; 4. Thomas Kjer Olsen (DEN, Husqvarna), +0:14.561; 5. Pauls Jonass (LAT, KTM), +0:20.793; 6. Hunter Lawrence (AUS, Honda), +0:40.508; 7. Michele Cervellin (ITA, Yamaha), +0:45.749; 8. Henry Jacobi (GER, Husqvarna), +0:46.400; 9. Jago Geerts (BEL, Yamaha), +0:53.877; 10. Maxime Renaux (FRA, Yamaha), +0:57.247. MX2 Verseny eredménye: 1. Jorge Prado (ESP, KTM), 45 points; 2. Calvin Vlaanderen (NED, HON), 45 p.; 3. Thomas Covington (USA, HUS), 44 p.; 4. Pauls Jonass (LAT, KTM), 34 p.; 5. Thomas Kjer Olsen (DEN, HUS), 32 p.; 6. Hunter Lawrence (AUS, HON), 31 p.; 7. Henry Jacobi (GER, HUS), 26 p.; 8. Michele Cervellin (ITA, YAM), 24 p.; 9. Jago Geerts (BEL, YAM), 24 p.; 10. Maxime Renaux (FRA, YAM), 22 p.
MX2 Bajokság állása: 1. Jorge Prado (ESP, KTM), 595 points; 2. 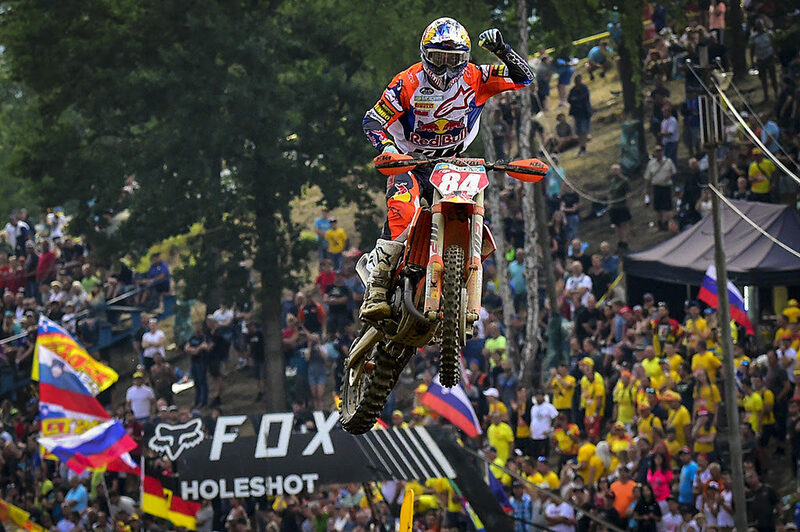 Pauls Jonass (LAT, KTM), 584 p.; 3. Thomas Kjer Olsen (DEN, HUS), 454 p.; 4. Ben Watson (GBR, YAM), 427 p.; 5. Calvin Vlaanderen (NED, HON), 414 p.; 6. Thomas Covington (USA, HUS), 375 p.; 7. Jago Geerts (BEL, YAM), 310 p.; 8. Michele Cervellin (ITA, YAM), 279 p.; 9. Henry Jacobi (GER, HUS), 249 p.; 10. Davy Pootjes (NED, KTM), 218 p.
MX2 Gyártók versenye: 1. KTM, 673 points; 2. Husqvarna, 569 p.; 3. Honda, 482 p.; 4. Yamaha, 475 p.; 5. Kawasaki, 326 p.; 6. TM, 119 p.